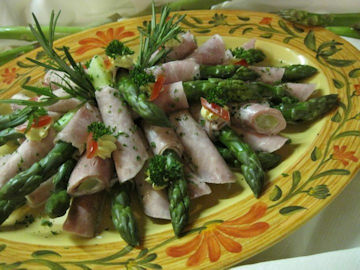 Spargelzeit - Asparagus Season ! in enjoying Germany's King of Vegetables. A glass of white wine will go well with it. Wednesday “Schunkelabend” with ‘Liab und Schneid’. Friday and Saturday ‘Harvey Jacobson’ at the piano. Gift Certificates $25, $50 ... available. Please call us.